What a weekend for the Cleveland Indians starting rotation. In helping the Indians take two-out-of-three against the Cardinals, the Tribe moved to a half-game behind the White Sox and, more importantly, may have rediscovered how to pitch. Josh Tomlin, Justin Masterson and Ubaldo Jimenez all went seven innings in their starts, with Tomlin having the “worst” performance of the trio as he gave up two runs; Masterson and Jimenez each limited St. Louis to one run in their starts. The trio also only walked one batter during the series. When you consider that the Cardinals are the highest-scoring team in the National League, and the second highest in all of baseball, that’s a solid weekend of work. Sunday’s game was the first time Jimenez did not walk a batter all season and, in his last two starts, he has walked just one batter. That’s pretty impressive for a pitcher that has walked 43 on the season (third highest in the American League) and hit this road trip with an ERA of 9.00 in road starts. The Tribe needed the solid pitching as they went 19 innings with scoring just one run before Jason Kipnis hit a three-run homer in the ninth on Sunday. 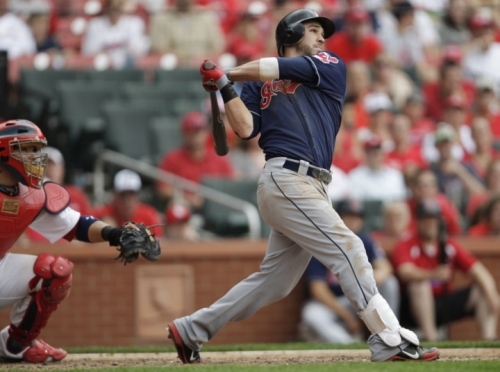 Kipnis’ hit was the only one (in nine chances) the Tribe had on Sunday with runners in scoring position and just one of two (out of 18 chances) the team had with men on base. Even with a few bright spots in the lineup – Michael Brantley is hitting .347 during his current 18-game hitting streak, and both Kipnis (.308) and Shin-Soo Choo (.310) are hitting better than .300 in June – the Tribe continues to struggle offensively. But they have been able to stay within a half-game of the White Sox thanks in part to their defense – just 29 errors on the season, fourth-best in the league – and because they’ve drawn the most walks in the majors (225). The Tribe is now 16-11 on the road this season and 4-2 on the road in June. That’s a key number as the Tribe plays a total of 18 games on the road this month, continuing Tuesday in Cincinnati against the Reds. The season is on the line for the Kent State baseball team tonight as the Golden Flashes take on Oregon in the deciding game in a three-game Super Regional series to earn a spot in the College World Series. After winning the opening game, Kent lost a 2-0 lead in the seventh inning of Sunday night’s second game, as the Ducks rallied for three runs to win, 3-2. The loss broke the Flashes’ 21-game winning streak. One advantage that Kent (45-18) may have, other than being a better team, is that Oregon has not won a series all season when they’ve lost the first game since their season-opener against Hawaii. The deciding game is tonight at 7 on ESPNU. Great opening weekend for the Euro 2012 tournament. Russia rolled over the Czech Republic, Denmark shocked Holland, Germany took down Portugal and it only took Spain three minutes to answer back against Italy. The draw ended a 14-match winning streak for Spain in competitive matches. The streak started in the last World Cup, when Spain lost its opening game against Switzerland, but went on to win the World Cup and followed it up by winning Euro 2008. The action continues today when England takes on France at noon, followed by Ukraine vs. Sweden. To help get you in the mood for the games, here’s a look at the uniform history of the European Championship from UniWatch.